For someone who isn't wholly convinced that a literal, personalized devil exits I talk about the devil a lot. Seriously, I talk about the devil and the satan all the time. And I've written a lot on this blog about the demonic. More, I've suggested that progressive and liberal Christians, many of whom doubt or don't believe in "the devil," need to start talking more about the devil. Admittedly, that is really strange advice. Why encourage people to talk about the devil when they don't believe in the devil? And why do I, personally, talk so much about the devil? There's my answer: For we wrestle not against flesh and blood. That is why I talk about the devil so much. The devil is a critical part in helping me practice non-violence. Progressive and liberal Christians are oriented toward social justice, combating systemic evil in the world. And yet, progressive and liberal Christians, because of their focus on immanence, making the Kingdom come on earth, also struggle with disenchantment. Which can create some problems. Because of disenchantment all we are left with are human agents. Consequently, in the progressive and liberal struggle for social justice the battle can start feeling more and more like it is "against flesh and blood." And when that starts happening we begin to participate in the cycles of violence going on around us. We begin, and here's the irony, demonizing other human beings--battling against flesh and blood. My point here is that in a disenchanted world we are tempted to battle against flesh and blood because flesh and blood is the only thing around to hate and aggress against. There is no room, in a flat, disenchanted world, for anything other than human beings to play the role of the satan. Which is why, paradoxically to be sure, the very Christians who don't believe in the devil might need to talk about the devil. Because talk about the devil adds depth--enchantment--to the flat, disenchanted conversation about our moral battles. And in adding this depth room is created, which allows our anger, hate and aggression to become deflected away from flesh and blood. To use psychoanalytic language, the devil creates space for projection and displacement as discussions of the "satanic" or the "demonic" are shifted away from human beings to a depersonalized and abstract space. In speaking out the devil I can gesture to impersonal and large-scale dynamics and forces that have perverse moral effects upon human persons and societies. My spiritual "battle" gets directed toward those forces and dynamics and, because of that focus, I might even have the capacity to look at my opponents in a sympathetic light. In short, by helping to enchant the world the devil aids in keeping us non-violent. Reference to the devil is theological and moral shorthand to remind ourselves that our battle is not against flesh and blood. The devil helps us displace anger, hate and violence, keeping these emotions alive and energized as vital energy given the battles we face, but deflected away people, especially our enemies, as we fight for a more just and humane world. For our battle is not against flesh and blood. And that is why I talk about the devil so much. Richard, thought you'd like to know that today's post is an epiphany for this reader. For all the times I scrutinized Eph. 6:11-12, I never stopped to consider what you're saying here. Thank you for your insight. So would it be fair to say that in Christ becoming the scapegoat to expose the unjust power structures, he didn't necessarily eliminate scapegoating entirely? Rather, he exposed the folly of targeting people and shifted the target of our scapegoating to its proper abstract location (i.e. the "devil", evil powers, etc.)? In other words, scapegoating actually IS a proper way to process evil as long as it's directed to the right place. No worries. I certainly don't expect anyone to go the places I go. I simply write from the place I'm at to be helpful to people who are in that same place or who have loved ones in that same place. Still, I do try to cultivate conversation across the liberal and conservative divide. This post for example, asking progressives to talk about the devil. I think hating inequality and hating the devil can be the same thing. Truth be told, I tend to talk less about "the devil" than about "the principalities and powers." So I'm hating the "principalities and powers"--the systemic forces--that create things like inequality or oppression. The temptation, however, when you start to slide the talk toward institutions, is that we tend to start demonizing the people holding various positions within those institutions. We start hating "flesh and blood." For example, think about the way people come to hate, say, the President. Of any party. The human being in that office comes to represent the entire US system--the principality and power of the United States--so we start to hate that person rather than the system. So when that human being steps out of the office of the President many are surprised to find that this person is, well, a person. Which is to say I think human beings are often "trapped" by the institutions they work for and serve but we often fail to recognize that and start hating the person rather than the system, which is largely invisible to us. So you have to keep reminding yourself to deflect your ire and anger away from "flesh and blood." You have to struggle to keep the humanity of the person always in view. And that we so often fail do that in American political discourse--keep the humanity of political opponents in view--is just another example of the "devil" affecting us and causing us to hate each other. That's the dynamic of "the devil." It's the invisible dynamic always out of view causing us to hate each other. We can't see what is going on. Which is why, biblically, the devil's main tool is deception. Lies. The way I'm thinking of it is basically like this. Let's assume for a second that the progressives who don't believe in a literal devil are correct. Thus, the "devil" is basically an idea or construct (neutral initially, as such) that becomes the personification of evil through our placing of blame/emotional catharsis. We then cast it (him?) out from amongst ourselves. We make this construct - which includes the evil aspect of the "powers", among other things - the "other" rather than the people that inhabit them. It seems to me there is very much a behavioral component to this. Sacrificial, not as much, though I think a case could be made in the sense that we are sacrificing our innate desire to blame people. A bit of a stretch, granted. Reality can be lived and experienced through the poetic as well as from a literal base, if not more. Besides, as I agree that liberal or progressive religion becomes flat without enchantment, so can conservatism that needs a literal starting point. I do not believe that I would not be the only one to say that my up bringing within conservative Christianity where the "miraculous" was high on the list for mental assent and affirmation created no mystery or awe for my daily existence. As a liberal, specifically a Christian Humanist, I use the words "angel" and "devil" freer and more frequent than I ever did when I accepted them as "correct belief". GOD AS ONE, GOD WHO IS LOVE, does not need an antagonist; yet, the failure to love creates one for us. However, ironically, when we are reminded consistently that we are God's children, it is then that we see what we are battling rather than turning the sword on ourselves. "The devil is not real but it's psychologically useful to prop up a 'devil doll' placeholder as a target or container for our emotions." This is faux enchantment and it strikes me as a weird bit of progressive gymnastics. If an "enchanted" world is more three-dimensional, if it "works" better for us emotionally, perhaps that's because it's accurate (in the literal sense). But if the "enchanted" world is false, if the devil is just a personalized projection of quaint medieval minds, then it's a "regression" and for progressives to revert to those metaphors and to continue to rely on those images would only be due to a lack of progressive imagination. Progressives should be exploring some more accurate, poetically rich images that can supplant "the devil" in describing these fundamentally impersonal spiritual realities. That's great if they can find such a poetry. Then again, for Christians that poetry already exists. I've learned a ton from Michael and his discussions about the satan being the accuser and how when we step into that role of accusation we become the satan for each other. This post explores something a bit different, trying to unpack how when accusations need to be made we deflect those away from each other. That is to say, in a world of evil and injustice accusations need to be made, so where and how are those to be directed ? I see that. To that extent, yes, I can see how in our battle against evil and injustice something has to get "sacrificed." And that might be a "sacrifice" within myself, putting to death, say, my own tendencies toward violence. Sorry, Richard, maybe my post was unclear. The debate about whether to talk about the devil is not about "literal" vs "poetic", as far as I can see. What I don't understand is why you as a progressive Christian invite other progressive Christians to adopt an inaccurate, completely wrong-headed poetic image. If the devil is not a person, if evil is impersonal, all the "enchanted" personalized imagery Christians have used is inaccurate at best and misleading at worst. Describing evil as a person may "work" or "add depth" in the short term, but ultimately if the progressive vision of the world is correct, what is needed is for progressive Christian imaginations to catch up with the new, impersonal nature of evil, not regress to old, quaint metaphors that apparently misperceive a structural reality as a person. Loved this post Bro. Richard! Miroslav Volf once said that "the idea of there not being a hell could only come from the suburbs of America" His point was that people who have grown up experiencing genocide and tyranny know a version of evil that is less abstract. I think this post helps me to put together some of the ways that Jesus could possibly say to them "Love your enemies"
I was trying to answer that question in the post. My arguement is that, while the progressive vision may be empirically "correct," it tends toward violence, because of its immanence. I could be wrong about that. But that's the argument I'm making. Correcting my double negative typo in comment above. My typing or my thinking is sometimes too slow for the other. "I do not believe that I would be the only one to say that my up bringing within conservative Christianity where the "miraculous" was high on the list for mental assent and affirmation created no mystery or awe for my daily existence". I get that's what you're trying to do but it seems like you don't see the myriad problems involved in promoting an idea to others that you and they both understand to be empirically "incorrect". The most obvious problem is that if there is no actual personified Adversary, adopting a wink-and-nod placeholder adversary that we all understand is "just shorthand" would fail to create a viable target or container for negative emotions. Deep down, the progressive Christian knows that the universe is still flat and immanent and I would suggest his/her emotions know that as well. The devil can only add depth and/or "enchantment" to the universe (emotionally, metaphorically, or in terms of theodicy) for someone who believes he actually exists. We might be talking past each other. A couple thoughts. If a particular progressive Christian "knows that the universe is flat and immanent," that is to say, they know with empirical certainty, that the world is fully disenchanted then, yes of course, this move wouldn't make a lot of sense. But we might then have a conversation about the difference between this sort of "progressive Christian" and, say, an atheist. All that to say, yes, I'm assuming because this person is a Christian that they have a bit of wiggle room left for the spiritual and transcendent, that there are resources left for mystery and the unknown. True, there might not be much room, but enough room to accomplish what I'm talking about. Also, this isn't some sort of weird cognitive switcharoo, asking people to believe in something that that they don't believe in. I'm talking about the use of metaphor and personification. Personification isn't spooky, it's a natural way we think about and describe the world. Just the other day I said, "this computer is evil." I don't think my computer is demon-possessed. All I'm saying is that when it comes to resisting evil in the world that progressives get comfortable with personification as it has some salutatory moral benefits. To say nothing about its ability for concise and powerful communication. Or in its reminder that there is more going on the world than what can be observed in test tubes. I'm arguing that this personification, if embraced, functions as a helpful and consistent reminder about aiming your hate away from human beings. Yes, perhaps there are other ways to do that. (And I'm all ears for suggestions about how you'd suggest progressive Christians should personify evil forces. I'm partial to "Old Scratch.") But this one way to go about that reminding. I think N.T. Wright makes this point very well. How the hatred of Jesus's people was directed toward the Romans keeping them stuck in cycles of violence. Jesus reconfigured the "battle" and aimed his focus on a different sort of enemy--"the satan"--creating the cognitive and affective capacity to "love your enemies." Jesus basically says, your battle isn't against the Romans but against the Satan. And the Satan is trying to get you to hate and kill the Romans. I'm somewhat new to your work, but it seems that much of what you do is find ways of identifying and getting around the impediments Christians encounter to loving others in the way Jesus called us to. The effort to use a personified devil to redirect ones hate, then, is consistent with that effort. Thanks for the explanation. I see the difference and I see how what you're suggesting progressives do can help to keep one's humanity in view, as you put it. Thanks, too, for doing what you do. I think progressive Christianity is going to save my faith and you're an important influence for me. Hey, no worries. I'm pretty stubborn myself. You've been very respectful and on target with your criticisms. So I appreciate you pushing back on the post. Richard your main point connects with a subject I have been ruminating on for some time-the use of demonic imagery in Christian Metal music and its relation to our call to Non-Violent love. For example the Band Demon Hunter's logo. Do images such as this help us "enchant the world" to keep us non-violent or do they merely compartmentalize them only to come out in ways, while non-violent, that are still destructive to ourselves and others? Sorry I tried uploading an image of the Demon Hunter logo and it did not go through. Here's another try. Thank you Dr. Beck for addressing psychological considerations regarding the personhood of the devil (needing a bad guy to vilify instead of fellow human-beings / co-sinners). 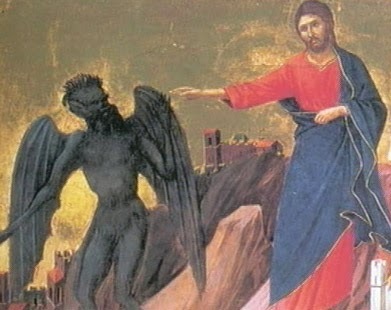 The "person" of Satan or the devil is tough to dismiss if for no other reason than it being documented that Jesus Himself addressed Satan in the third-person and at times, second-person. Speaking for myself, detaching from an "enchantment faith/world view" is difficult if not impossible to do without also detaching from loving God's mystical/beautiful attributes. Concerning evil, the struggle NOT to blame flesh and blood (I appreciate one of the bloggers asking about scapegoating) - invariablly finalizes with me placing that anger/blame upon God (shamed to admit) instead of the devil. Regarding theodicy, where suffering comes from, I resonate with you. I, too, tend to blame God more than the devil. My struggle with this, however, is something that Greg Boyd has pointed out. How for many progressive Christians we've lost a theology of revolt in the face of evil and have, rather, turned evil into an intellectual, theological puzzle. Thus, evil wins in two different ways. First, by causing suffering. And second, by making us introverted, doubters rather than resisters. I think Greg has a point here as this has been my own biography with doubt. All that to say, my attempts here to recover or reclaim the language of "spiritual warfare" is an attempt, at this point in my spiritual journey, to get out of my own head, theologically speaking, and get back into the game. An attempt to exchange doubt for an energized theology of revolt. The other point you make that I think is important is how the language of the devil keeps us tethered to Jesus. When progressives lost the language of spiritual warfare I think they unwittingly lost their connection with the exorcist from Nazareth. Thanks Barbara. For the record, I don't have any issues with anyone who believes in a literal Satan. I'm mainly trying to carve out some common ground where people can share language but welcome some diversity of opinion. Yes. And it's less "my work" than my sharing the hodgepodge of thoughts and experiences I have as I try to sort out what it mean to emulate Jesus in my life. To sort through, try out, test, explore, reclaim, repurpose, grab a hold of and use everything within the Christian faith, every scrap of it, if it gives me leverage in becoming a more loving human being as I see that displayed in the life of Jesus. Not all progressives eschew the supernatural. Some us believe it is very real even though we have no iron-clad-Euclidean-proof that it exists. I've often thought of how ironic it is that even in the super saturated world of scientific materialism we all inhabit, we spend hundreds of millions every year to go and see the latest sci-fi and fantasy flicks with gusto. First off let me say I'm open to the idea that every time the words Satan and Devil are used in the bible they are not referring to Satan/the devil as in the fallen angel. There's verses that I see with Satan/Devil as very clear they are not referring to the fallen angel. But there's other verses I see that are pretty straight forward as referring to a person/angel/demon called Satan/Devil. This might sound very simple minded, but if I'm to have an imaginary scapegoat so I'm not aiming things or blaming things on flesh and blood then I know there will come a time when I want to face reality and then wrestle against flesh an blood. But I guess a lot of christians, myself included at one time, get caught up in hating Satan(the person/fallen angel) instead of looking at the big picture and seeing that Satan, principalities, powers, the rulers of the darkness of this world, spiritual wickedness in high places are only given as much power as God allows and God will bring His purpose into it and work it out according to His purpose. For me the wrestle can be forgiving and loving Satan, principalities, powers, the rulers of the darkness of this world, spiritual wickedness in high places as much as we we need to forgive and love flesh and blood. I know this might sound crazy But if God has reconciled all creation to Himself through Christ and will be ALL in all, then the reality is they are included. Thank you for that. I appreciate it. I would sort of like to know how you interpret scriptures, like the wilderness temptation of Christ. I am very curious, and assure you I am not looking for argument or to ridicule your ideas. On the contrary. I would love to know. That's hard to answer. I interpret Scripture all sorts of ways. Sometimes I interpret it literally and fundamentalistically. Sometimes metaphorically and poetically. Sometimes historically and critically. I don't rest on any one method. I move across all of them, back and forth. That's a great point above about condemning. I think about that a lot. The way people constantly create "the other." It's one of the ironies I see a lot of with non-believing liberals - holding to this idea that religion is this horrible destructive force, which leads them to dehumanize believers without any understanding of richness and variety of religious belief. Lots of people think they are too advanced for religion, but they've never read the Gospels (or any other important religious and moral text, e.g. The Eightfold Path, etc.). If you can't bring yourself to love others and to treat all sentient beings with compassion . . . then it's safe to say you're not too advanced for religion. "That's the dynamic of "the devil." It's the invisible dynamic always out of view causing us to hate each other." I have been really processing this post for a few days now, and I just have to comment on how helpful I think this is to put not only the Satan, but out own propensities to direct our hate toward each other into a useful framework. Growing up Pentecostal, which talks a lot about Satan, demons, etc, I eventually came to see the whole thing as a spiritual cop out. But perhaps I am looking at it too simplistically, or to antagonistically. I still think this is the case in many instances with the potential to be very dangerous, especially when you see it applied to mental or, in rare occasions, physical illness. But the other side has hidden dangers as well, which you describe quite nicely. I see progressives falling into two camps: those that struggle against flesh and blood, and those who don't seem to struggle against anything. As I've noted before, I grew up in the ghetto (or at least I could see if from my front porch). I've seen the front of this spiritual war. I can't pretend it doesn't exist, but I need better language to frame it and to be able to find some solidarity with those who are also fighting it but from a different theological position. This appears to me to be a good starting place for formulating that language. The observation of people in a psychological state of 'possession' like your dad, is an example to me as a therapist of when it useful to have the concept of a 'demon' or 'evil spirit.' Such constructs are very useful in therapy to explain a lot of behavior. If you were in a session with me I would explore those times when your father was in a rage to see if it really seemed that he was in an altered state as if possessed by another entity. I am agnostic as to the source of such entities because whether they are the biblical demons or an energy form created by mankind (in a Jungian way) does not matter to me. What matters in understanding your life is that this was "not dad." I see your point of displacing hate or anger away form people makes the devil useful. From my point of view anger and hate are different emotions / energies with different uses. Anger is to be used to empower loving confrontation, for example, speak the truth to power in nonviolence talk. Hate is the emotion of vengeance and best left alone altogether. We are called to forgive not displace our hate somewhere else. However, on the ground, in real life, a righteous anger from victim to abuser seems to penetrate the spiritual realm and forces the evil powers to back off. This is an unusual manifestation, it seems, of 'righteous anger' that feels as intense as hate. In other words, it will shift a relationship. I make a lot of use of the concept of demons in therapy - used with a lot of caution - but in instances when the behavior of parent or spouse can best be understood as the manifestation of an entity that is not the person. I am agnostic as to what exactly this entity (demon) is or where it comes from. I use it for practical purposes to help us understand our lives and I don't need to have theological answers. I am a practitioner. I was very impressed with this reflection and had to admit that I had never thought about Satanism in that way. When the powers and principalities have co-opted the Church and the language of God and Christianity for its own devices, it stands to reason that Satanism becomes resistance of those powers and principalities. Have you ever encountered this idea of Satanism as polemic against a corrupted version of Christianity? I think the 'new language' I use to discribe the old classic “wrestling w/ principalities, powers, the rulers of the darkness of this world, spiritual wickedness in high places” could actually be attributed to a specified cause such as the systematic ways in which flesh and blood agents under the influence of things like structural violence, dysfuntional alcoholic family & business systems, post traumatic stress, vicious capitalism, mental illness, narcissistic personality disorders, the repetion of trauma and self sabotoge, the progressive illness of addiction to substances & addictive behavior which the ancients of their time knew as the subtle, invisible powers that often have no one specific person who can (or will) be held responsible. I think forgiving and loving these flesh and blood agent entities means recognizing the underlying evil which controls their mental/emotional content and context. I think all of who are caught in the effects of Satan’s, principalities, powers, rulers of the darkness of this world, spiritual wickedness in high places might have an advantage in the battle by faith in recognizing/realizing in God a reconciled creation to Himself through Christ. the 7 deadly sins are usually given as wrath, greed, sloth, pride, lust, envy, and gluttony. Each is a form of Idolatry-of-Self wherein the subjective reigns over the objective. i think maybe 'the super saturated world of scientific materialism we all inhabit' is yet another content and context that gives the illusion of mental/emotional control. i think progressive christianity is capable of using another language w/ new terms inspired by].... the devil [that keeps us] tethered to...[him rather than] Jesus. i think that true recovery or reclaimation of reaity of spiritual warfare is by invitation of the holy spirit to be involved. for this to happen i will be given a gift of discernment of spirits and intentions. progressive christianity can be yet another fantasy attempt to escape content and context of the world and 'to exchange doubt in my own agency for yet another illusion energized ...[by progressive christian] theology of controll sustained human revolt. i agree w/ you that 'When progressives lost the language of spiritual warfare', I think they unwittingly lost their connection with the exorcist from Nazareth.' progressives can organize religion criminally just as well as any of the 'old schools' can. i think when the powers and principalities have co-opted the Church and the language of God and Christianity for its own devices, that's Satanism. i can think of more and practical 'lens' thru which to see "the devil" at work. might they be found in fearless validating explorations into scientific, psychological, artistic, non rational, non analyitical & poetic means of communicating these fundamentally impersonal spiritual realities and processes of progressive evil?